The religious world is filled with charlatans and con artists. Robert Tilton is a covetous, money-hungry, lying, false prophet who teaches damnable heresies. He touts about prosperity, health, and wealth; but Tilton's message is totally contradictory from the Word of God. Tilton quotes 3rd John 1-2, "Beloved, I wish above all things that thou mayest prosper and be in health, even as thy soul prospereth." What Tilton fails to mention is that John the Apostle, who spoke those words about prosperity, was shortly thereafter exiled in punishment to the island of Patmos (Revelation 1:9). Of the 12 Apostles, 11 were martyred. Jesus Himself was crucified! Listen to the words of warning from Jesus, in sharp contrast to the lying words of Robert Tilton ... "If ye were of the world, the world would love his own: but because ye are not of the world, but I have chosen you out of the world, therefore the world hateth you." Lazarus was poor, and he ate of the rich man's garbage. Paul said, "I know both how to be abased, and I know how to abound: every where and in all things I am instructed both to be full and to be hungry, both to abound and to suffer need." Paul penned most of the New Testament books, and yet we find him having to make tents for a living (Acts 18:3). The Apostle Paul was stoned, shipwrecked, and suffered greatly as a Christian ... "Are they ministers of Christ? (I speak as a fool) I am more; in labours more abundant, in stripes above measure, in prisons more frequent, in deaths oft. Of the Jews five times received I forty stripes save one. Thrice was I beaten with rods, once was I stoned, thrice I suffered shipwreck, a night and a day I have been in the deep; In journeyings often, in perils of waters, in perils of robbers, in perils by mine own countrymen, in perils by the heathen, in perils in the city, in perils in the wilderness, in perils in the sea, in perils among false brethren; In weariness and painfulness, in watchings often, in hunger and thirst, in fastings often, in cold and nakedness" (2nd Corinthians 11:23-27). Tilton would lead us to believe that financial prosperity and health are guaranteed to anyone who meditates upon certain Scriptures in the Bible. Tragically, Tilton never tells his viewers on TV how to actually become a Christian. He never mentions sin, condemnation, or judgment. Tilton is another false prophet who exploits Christianity for his own personal gain. Tilton is in league with Balaam, a false prophet in the Old Testament who corrupted God's people for his own personal gain. Tilton misinterprets the promise by God to bless Abraham's descendants. Tilton quotes Genesis 22:8, "And in thy seed shall all the nations of the earth be blessed; because thou hast obeyed my voice." According to Tilton's perverted interpretation of this Scripture, there will be worldwide financial prosperity. Tilton claims proof of this fulfilled prophecy by pointing out that America's number of millionaires went from 3,600,000 millionaires in 1991 to over 7,000,000 in 2001. According to Tilton, the 10,000,000 millionaires in America today are a fulfillment of Genesis 22:8. Unfortunately, nearly all of those 10,000,000 millionaires are unbelievers, lost sinners bound for Hell when they die without Christ. God never promised anything to unbelievers except eternal death in Hell. You can mediate upon all the Biblical principles you want and still go to Hell. Is that prospering? I would rather have NOTHING in this world, but go to Heaven one day; then to have paradise on earth, and go to Hell someday. You can keep this sin-cursed world, just give me Jesus! The promise of God to Abraham in Genesis 22:8 refers to the Gospel of Jesus Christ, and the Word of God, which was given to the world through the nation of Israel. It is blasphemy to teach that God intended for the world to become FINANCIALLY rich. If that's the case, then why does 3,000,000,000 of the earth's population live on less than $2 a day? Well Mr. Tilton? The prosperity preaching of the Charismatic Movement Satanic!!! The Word of God warns us in 1st Timothy 6:9, "But they that will be rich fall into temptation and a snare, and into many foolish and hurtful lusts, which drown men in destruction and perdition." Robert Tilton is deceitful, and leads the unsaved to believe that they can be blessed of God while rejecting Christ as Savior. Tilton leads Christians to believe that they have a right to financial prosperity, health, and success. Yet, we read in the Bible about Jacob's sorrow when Rachel died while giving birth to Benjamin (Genesis 35:18). We read about Timothy's "often infirmities" (health problems) in 1st Timothy 5:23. Paul had been given "a thorn in the flesh" by God to keep him humble (2nd Corinthians 12:7). Listen to what Paul considered prosperity ... "Therefore I take pleasure in infirmities, in reproaches, in necessities, in persecutions, in distresses for Christ's sake: for when I am weak, then am I strong" (2nd Corinthians 12:10). You'll never hear Robert Tilton say any such thing. Paul said he took "pleasure" in his problems and sufferings. Listen to what the Apostle Peter said in 1st Peter 1:7, "That the trial of your faith, being much more precious than of gold that perisheth, though it be tried with fire, might be found unto praise and honour and glory at the appearing of Jesus Christ." Rejoice in the trial of your faith? Take pleasure in infirmities? What a sharp contrast from the garbage that Robert Tilton teaches! Tilton has authored such demonic books as "How To Be Rich & Have Everything You Ever Wanted" (2004), and "The Power To Create Wealth" (1988). We are warned in 2nd Timothy 4:3 about these perilous times ... "For the time will come when they will not endure sound doctrine; but after their own lusts shall they heap to themselves teachers, having itching ears." America is a covetous and selfish nation. We pat ourselves on the back and boast of our generosity; BUT, we give peanuts compared to what we keep for ourselves. It is a shame that you can't get people to listen to preaching anymore unless you tell them how to get rich and prosper. I was sickened as I watched Robert Tilton's Success-N-Life show, which uses pictures of yachts and tropical beaches to entice his victims. What happened to the "cross" that Jesus commanded us to bare as His followers, "And he said to them all, If any man will come after me, let him deny himself, and take up his cross daily, and follow me" (Luke 9:23). Tilton would lead you to believe that the Lord promised us a Rolls Royce instead. Jesus clearly taught in John 15:20 that the servant is NOT greater than his Lord, and that we would suffer as He did ... "Remember the word that I said unto you, The servant is not greater than his lord. If they have persecuted me, they will also persecute you; if they have kept my saying, they will keep yours also." Tragically, Robert Tilton is silent concerning how to be saved. He never mentions being born-again; yet, he speaks of prosperity. Jesus warned in Matthew 16:26, "For what is a man profited, if he shall gain the whole world, and lose his own soul? or what shall a man give in exchange for his soul?" The whole world is headed for Hell-fire; BUT, Robert Tilton is interested in selling you his books. It is evil that any so-called man of God would continually preach about getting wealthy and becoming financially successful. False prophet Joel Osteen draws in thousands of people to hear his liberal, watered-down, substance-lacking, sermonettes. He never warns anyone about Hell-fire, or the judgment of God to come upon lost sinners. What a sharp contrast compared to Jonathan Edward's SINNERS IN THE HANDS OF AN ANGRY GOD. Robert Tilton is in the same boat as Joel Osteen, and Balaam--all greedy of gain. Ninety-nine percent of the people in this world have never been born-again by the Spirit of God, and are walking in darkness without Jesus Christ. How tragic that so many professed "men of God" are only interested in making more money. Even some of America's most faithful preachers have fallen into the trap of covetousness and greed. In so doing they have compromised their beliefs, trimmed their sermons, and become silent concerning sin. Of course, they are in denial. A 1991 ABC News investigation, spearheaded by Trinity Foundation president Ole Anthony and broadcast on ABC's Primetime Live on November 21, 1991, found that Tilton's ministry threw away prayer requests without reading them, keeping only any money or valuables sent to them by viewers, to the tune of more than $80 million (U.S.) a year. Anthony, a Dallas-based minister whose Trinity Foundation church works with the homeless and the poor on the East side of Dallas, had taken an interest in Tilton's ministry after some of the down-on-their-luck people coming to the Trinity Foundation for help told him they had lost all of their money making donations to some of the higher-profile televangelists, especially fellow east Dallas minister Robert Tilton. Curious about the pervasiveness of the problem, the Trinity Foundation got on the mailing lists of several televangelists, including Tilton, and started keeping records of the many types of come-ons they'd receive almost daily from big-media ministries. When former Coca-Cola executive Harry Guetzlaff came to the Trinity Foundation for help and told Anthony that Guetzlaff had been turned away from Tilton's church when he found himself on hard times following a divorce--even though he'd been a long-time high-dollar donor, giving up his last $5,000 as a "vow of faith" just weeks earlier--Anthony, a former intelligence officer in the United States Air Force and licensed private investigator, started working on gathering details on Tilton's operation. When ABC producers, who had started working on their own investigation into a number of televangelists in early 1991, contacted the Trinity Foundation for information on Tilton, the two groups pooled their efforts. Anthony agreed to portray himself--a Dallas-based minister with a small church looking into how big-media ministries were able to grow so quickly--in a hidden camera operation to get behind the scenes at Response Media, the group handling Tilton's mass mailings. The director of Response Media told Anthony and the hidden cameras everything they needed to know, including the major revelation that the prayer requests not only were never read by Tilton, but that they were never even intended to be read by him; they were mere advertising gimmicks to get the donor to respond to the plea for fundraising and were forwarded unopened to the many banks the ministry used in Tulsa, Oklahoma. Trinity Foundation members, acting on this information, started digging through garbage dumpsters outside Tilton's banks and the office of Tilton's lawyer, J.C. Joyce, and found tens of thousands of discarded prayer requests, bank statements, computer printouts containing the coding for how Tilton's "personalized" letters were generated, and more, all of which were shown in detail on the Primetime Live documentary. In a follow-up broadcast on November 28, 1991, Primetime Live host Diane Sawyer said that the Trinity Foundation and Primetime Live assistants found prayer requests in bank dumpsters on 14 separate occasions in a 30-day period. 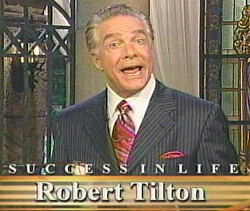 Tilton vehemently denied the allegations and took to the airwaves on November 22, 1991 on a special episode of Success-N-Life entitled "Primetime Lies" to air his side of the story, which included an affirmation that not only had he never thrown prayer requests away, but had in fact lain atop them in prayer for so long that "the chemicals [from the ink in the prayer requests] actually got into my bloodstream, and[...]I had two small strokes in my brain." Tilton also asserted that the prayer requests found in garbage bags shown on the Primetime Live investigation were stolen from the ministry and placed in the dumpster for a sensational camera shot. Tilton also had an unusual explanation for a plastic surgery operation revealed by Primetime Live: apparently, the chemicals from the prayer requests also got into his eyes and created bags under them, which only plastic surgery could remove. Primetime Live's investigation included interviews with several former Tilton employees. One of Tilton's former prayer hotline operators claimed that the ministry cared little for desperate followers who called for prayer, saying that Tilton had a computer installed in July 1989 to make sure the phone operators were off the line by seven minutes. In follow-up segments, Primetime Live interviewed Tilton's former maid, who claimed that prayer requests were sent to Tilton's house and were routinely ignored until he told her to move them out of the house and into the garage; according to the maid, "they stacked up and stacked up" in Tilton's garage until he had them thrown away. In the same interview, Tilton's former secretary came forward and claimed that Tilton used excerpts from "get-rich-quick" books and used them in his sermons, and that she never saw him perform pastoral duties such as visiting with the sick and praying with members. Despite Tilton's repeated denials of misconduct, the state of Texas and the Federal government got involved in subsequent investigations, finding more causes for concern about Tilton's financial status with each new revelation. According to an October 1993 memorandum to Tilton's lawyer, J.C. Joyce, from Rev. James Eugene Ewing, Ewing used a computer demographics program that identifies and isolates some of America's poorest sub-ZIP codes to identify targets for Ewing's "St. Matthew's Churches" group clients--Tilton among them--to send mailings soliciting for new seed-faith "vows". The memo noted, among other details, that "[t]he size of each special area is about two to four city blocks[...][a]nd thank God there are tens of thousands of them across the nation." As each revelation became increasingly more damaging, viewership and donations declined dramatically, prompting Tilton to stop paying for television airtime for Success-N-Life in 1993, and the last episode aired nationally on October 30, 1993. In 1992, Tilton sued ABC for libel because of its investigation and report, but the case was dismissed. Several donors to Tilton's television ministry sued Tilton himself in 1992 and 1993 charging various forms of fraud. One of the parties suing won $1.5M (US) in 1994 when it was discovered that a "family crisis center" for which they had made donations (and recorded an endorsement testimonial) was never built nor was ever intended to be built. The judgment was later reversed on appeal. The decline of Success-N-Life also led to the end of Tilton's 25-year marriage to wife Marte, who had served as the administrative head of the Word of Faith Family Church and World Outreach Center, in 1993. "Take heed, and beware of covetousness: for a man's life consisteth not in the abundance of the things which he possesseth."